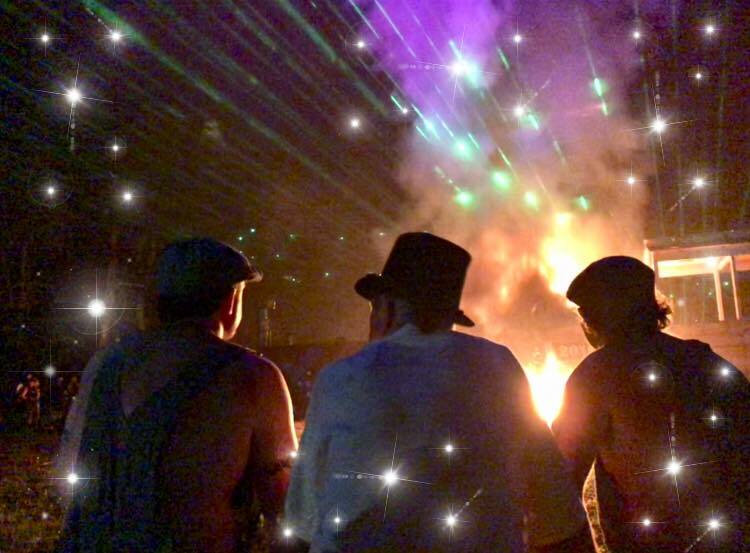 It’s the most anticipated party invitation of the summer – the AHG, Alberti Hurdy Gurdy – that sees the pastoral Schoolhouse Farm transformed into a weekend-long venue for music, dancing, barbecue, and laser light shows, all leading up to the burning pinnacle of the evening! What started out 21 years ago in East Bridgewater as a graduation party for Dave Alberti’s son has grown over the years into a gala few could imagine! Plympton’s C.J. Quinn, with his good friends Dave and Vicki Alberti, take the better part of a year preparing for an AHG Theme Party – this year’s was “Steampunk” – with all the side events that make their party unique. Eight bands, some of them have played on the outdoor stage since the first one, and three glass-blowers added to the atmosphere this year. In keeping with the Steampunk theme, there was also a working display of steam-powered engines built by north shore artist Todd Cahill who Dave and Vicki saw at the annual Watch City Steampunk Festival in Waltham earlier this year. Many of the AHG guests brought tents and sleeping bags and stayed through the night while the laser light show carried on over their heads. 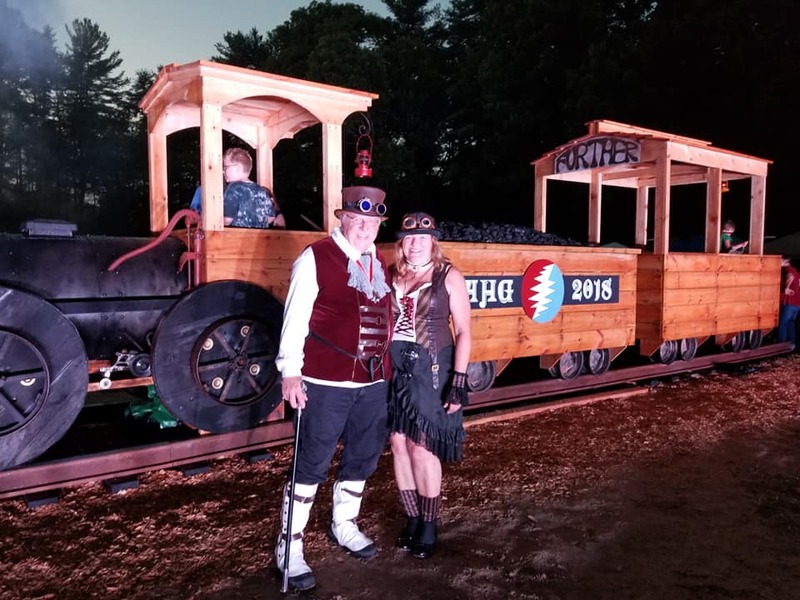 This year’s centerpiece was a full-sized 1890s steam locomotive built out of rough sawn wood, plywood, and salvaged metal wheels, resting on a 60’ section of wooden train track. The sculpture was constructed by CJ Quinn and Tom Johnson, and was built on a custom wooden foundation laid over two truckloads of river silt spread & graded by Dave Alberti & John Deere. Tom Johnson played a key role in design and construction following CJ’s lead as Chief Engineer. The two worked together for months leading up to the event. People admired the construction all afternoon, posing with it for many photos. As darkness descended, and the last notes were played from the main stage, the entire crowd descended around the burn structure in anticipation of the climax of the event. “The Burn”. A professional Taiko Drum troupe called “Odaiko New England” began the ceremony with 15 minutes of thunderous rhythmic perfection. Dozens of people in period costumes spilled off of the train and a vintage town scene quickly morphed into a compelling choreographed dance led by Alana Quinn and Kyra Grattan. 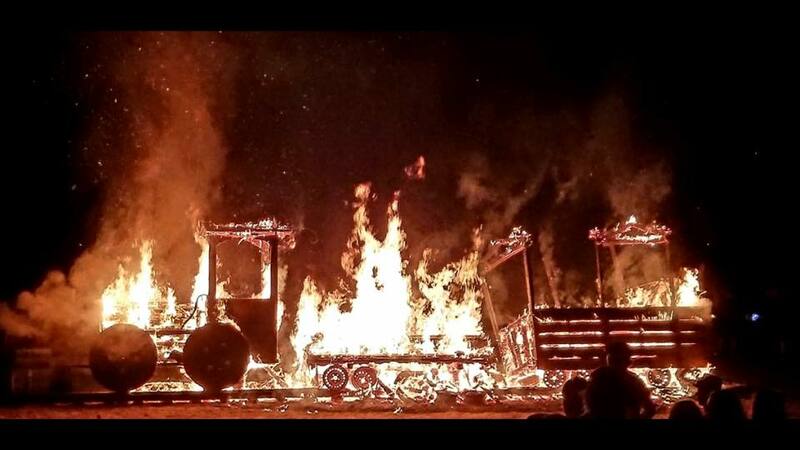 As the theme music hit a climax, flames consumed the train as the AHG crowd celebrated having collectively created another unforgettable experience. By morning, all that was left was ash and coals, and a few metal pieces. Plympton Fire volunteers were on hand to take care of site safety issues. They sent an engine, brusher, two ATV’s with five fire fighters/EMTs to stand watch. The AHG crowd is a network of friends, and there is a uniquely positive and respectful energy in the air. AHG is a grassroots collective of people that has evolved since 1997. Every year, a few new people find their way to the event, and every year there is a new theme to welcome them. In 2015 the theme was “A Midsummer Night’s Dream” with a Japanese-style pagoda as the centerpiece. Dave and Vicki Alberti were married under the pagoda with all of their Hurdy Gurdy friends and family in attendance. And once the vows were spoken and the rings exchanged, the bridegroom kissed the bride, the torches came out and the pagoda was burned. Each AHG since the beginning has its own T-shirt designed by one of the many AHG artists, a theme poster, and bumper stickers. Shirts from past events have become collectors’ items. Many artists over the years have captured the party theme; this year’s poster design was done by well-known local artist Jessie Fries. The t-shirt and bumper sticker design was done by Greg Myette. Greg Crossland was the grill chef for the party with lots of help from Dave and Trish Detterman, grilling 90 pounds of chicken, two bushels of corn, and cooking 100 pounds of potatoes, making the best fries. Guests are asked to bring enough food to feed their families plus a little more, then Greg cooks and serves it. Sunday morning, Jimbo Williamson makes breakfast to send everyone on their way with a full stomach. 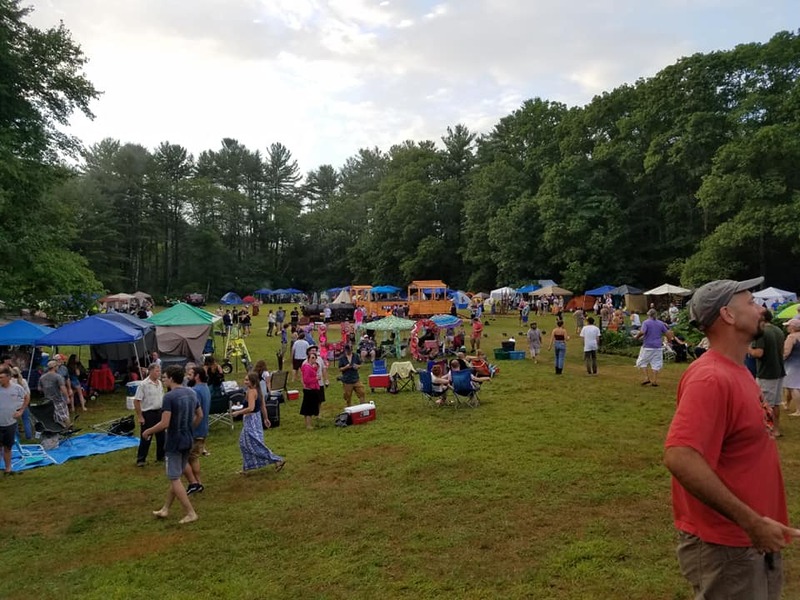 So what began 21 years ago as a graduation party, with a wood-fired portable hot tub, a keg of beer, and a band, has grown into finely orchestrated summer event whose guests are treated to a weekend to remember.